Over the past week, two fascinating Trump-Russia storylines have emerged. One is the revelation that Michael Flynn first established contact with a much younger Russian woman in 2014 who turned out to have Russian government spy connections. The other is that Roger Stone slipped up and referred to Russian government hacker Guccifer 2.0 as “her” during a recent interview. 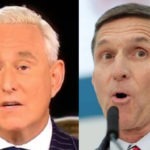 That’s led to a fascinating, if at this point only hypothetical, question being asked across social media: what if Flynn and Stone were both dealing with the same woman? Here’s what we know about Flynn’s female Russian connection: At a conference in the United Kingdom in 2014, Mike Flynn met a Russian woman named Svetlana Lokhova. He failed to report that contact to his employer the DIA, even though he was required to do so – because it’s often how spies cultivate assets. Around that same time he began acting erratically at work and had to be fired. Later he invited Lokhova to travel with him to Moscow, asking her to serve as a translator. He also sent her an email and signed it “General Misha” – Russian for Michael. And it turns out Lokhova is so well connected to Putin and the Russian spy world that she was allowed to see the Russian GRU spy records, which has only happened two or three times during Putin’s entire reign (source: The Guardian). The specific nature of the interactions between Flynn and Lokhova, and how long they lasted, have not yet been spelled out. But it’s led to the popular (unverified) theory that Lokhova was a Russian spy recruiting Flynn as an asset from the start, using her status as a much younger woman to lure him in; this is fairly common practice in the spy world. Flynn went on to have dinner with Putin in Moscow at the end of 2015, then he joined the Trump campaign in early 2016, and he had repeated contact with Kremlin representatives throughout the election cycle, before being fired once it became public. Here’s what we know about Stone’s female Russian connection: She was his contact or go-between for Russian government hacker collective Guccifer 2.0, which stole Democratic Party emails and released them to help Donald Trump. Beyond that, we know nothing. We don’t know her name or who she is. We only know she’s a woman because Stone told us so (link). And yet a number of people on social media have begun floating the theory that Michael Flynn’s Russian contact Svetlana Lokhova was also Roger Stone’s female Russian contact at Guccifer. The theory is based only on the fact that both men were brought into the Russia fold by a woman, and the larger pattern in which the Kremlin seems to like using female Russian operatives to recruit older American men. In that regard, why not use the same operative to lure Stone in 2016 who had already successfully lured Flynn in 2014?